botanically, the xylem tissue that forms the bulk of the stem of a woody plant. Xylem conducts sap upward from the roots to the leaves, stores food in the form of complex carbohydrates, and provides support; it is made up of various types of cells specialized for each of these purposes. 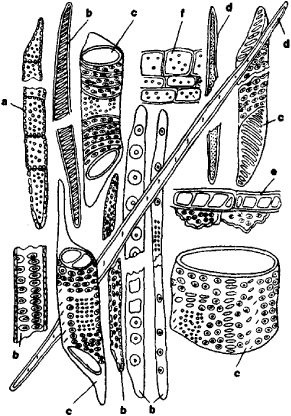 Among them are tracheids, elongated conduction and support cells; parenchyma (food storage) cells, some of which form rays for transverse conduction; xylem vessels, formed of hollow cells joined end to end; and fiber cells that reinforce these tubes. In the conifers the xylem is made up mainly of tracheids, thus presenting a uniform, nonporous appearance; their wood is called softwood. Deciduous trees have more complex xylem, permeated by vessels, and are called hardwoods, although the description is sometimes inaccurate. ..... Click the link for more information. ; in temperate regions the cells formed in the spring are larger in diameter than those formed in the summer, and this results in the annual rings observable in cross section. The new cells lose their protoplasm as they form the various tissues; the older, nonfunctional cells become plugged up, darken in color, and often accumulate bitter or poisonous substances (tannins, dyes, resins, and gums). This inner wood (the heartwood, as opposed to the functional sapwood) is valued for outdoor construction because of its resistance to moisture and to decay-producing organisms. Freshly cut wood contains much moisture and tends to warp and split as it dries. Lumber is therefore seasoned before use—dried either slowly in the sun and air or more quickly by artificial means (kiln drying). Seasoning increases wood's buoyancy, strength, elasticity, and durability. Although synthetic materials have supplanted wood in many of its former uses, it is still widely employed for furniture, floors, railway ties, paper manufacture, and innumerable other purposes. Wood distillation yields methyl alcohol, wood tar, acetic acid, acetone, and turpentine; charcoal is made by burning or heating wood in insufficient air to consume it. , thin leaf of wood applied with glue to a panel or frame of solid wood. The art of veneer developed with early civilization. It produces richly grained effects cheaply and is used also on structural parts that must be cut with the grain for strength. manufactured board composed of an odd number of thin sheets of wood glued together under pressure with grains of the successive layers at right angles. Laminated wood differs from plywood in that the grains of its sheets are parallel. wood product produced in the form of a board or sheet, formed of cellulose fibers or particles derived from wood or other sources, and used principally as a building material. (CLT), manufactured wood panels that consist of layers of boards glued together under pressure with the grain of the boards in one layer running perpendicular to the grain in adjoining layers. wood that has had a liquid preservative forced into it in order to protect against deterioration due to rot or insect attack. The most commonly used preservatives are chromated copper arsenate (CCA) and pentachlorophenol. ..... Click the link for more information. is lumber that has had a preservative forced into it under pressure. See H. Cone, Wood Structure and Identification (1979); H. Bucksh, Dictionary of Wood and Woodworking Practice (2 vol., 1986). The hard, fibrous substance that composes the trunk and branches of a tree, lying between the pitch and the bark. Any of the various mixtures that are molded to simulate wood; often using sawdust, paper, or other wood fiber as a major ingredient mixed with glue. A deciduous softwood tree resistant to decay and often used in contact with the soil and for exposed elements such as wood shingles; also used for flooring and trim. A softwood tree with coarse-grained wood, used for interior trim. A large hardwood tree, with soft straight-grained wood used for painted millwork. Tapered boards used as siding, installed with the thinner part at the top. A moderately strong, high-density wood, yellowish to brown in color; its uniform texture is well suited for veneer, flooring, and turned wood products. A decorative pattern in wood caused by adjacent knots. A highly aromatic, moderately high-density, fine-textured wood of a distinctive red color with white streaks; widely used for fence posts, shingles, and mothproof closet linings. An even-textured, moderately high-density wood, rich red-brown in color; takes a high luster, and is used for cabinetwork and paneling. A light, coarse-grained, medium-hard wood, used for ornamental work and trim. One of a series of boards used for siding, with a tapered cross section, most commonly called beveled siding. A wood siding commonly used as an exterior covering on a building of frame construction, applied horizontally and overlapped, with the grain running lengthwise, thicker along the lower edge than the upper. A tree belonging to the botanical group which bears cones; it includes all the softwoods used in building, particularly the pines and firs. A moderately strong, hard, and heavy softwood; its heartwood is naturally decay-resistant, and is used for exterior and interior construction where durability is required. Rough-sawn wood with a rectangular or square cross section that exceeds the nominal dimensions of 4 by 5 inches. in art. Since ancient times wood has been used in architecture, sculpture, and decorative applied art, especially folk art, including such applications as utensils and furniture, often stained or decorated with carvings, intarsia, paintings, or gilding; carvings on the facades and interiors of buildings; and the facing of walls with laths or planks. Wood has also been used in the preparation of forms for woodcuts, printed cloth, and cookies. The wealth of color nuance in wood and the diversity in its texture and graining—its waviness, concentricity, and the pictorial interweaving of its fibers—makes possible a multitude of decorative effects, while the relative ease with which wood can be worked enables the artist to express his creative energy with greater spontaneity. Dvoinikova, E. S., and I. V. Liamin. Khudozhestvennaia obrabotka dereva. Moscow, 1958.
xylem, the complex tissue of arboreal and herbaceous plants that conducts water and dissolved mineral salts within the plant. Wood is the part of the conducting bundle that is formed from the procambium, or primary xylem, and the cambium, or secondary xylem. It forms the major portion of the trunk, roots, and branches of arboreal plants. gradually become clogged—the vessels, with so-called tyloses, and the tracheids, with tori of their bordered pits. The conductive and storage systems cease to function and the wood’s content of water, starch, and oils decreases. The amount of resin and tannic substances increases. In heart-wood varieties, such as pine, larch, and oak, the central part of the wood differs in color and is called the heartwood; the outer zone is called the sapwood. In ripe arboreal varieties (such as spruce and linden) the outer part differs from the center in that it has less moisture. This type of wood is called mature. Sapwood varieties, such as maple and birch, show no distinction between the central and the peripheral parts. Sometimes the trunks of sapwood and ripe arboreal varieties have darker centers (usually the effect of fungi), forming so-called false heartwood. distribution of these elements (for example, the diameter of the vessels of different varieties ranges from 0.0015 mm in box and aralia to 0.5 mm in oak) create the diversity of wood structure (see Figure 3). 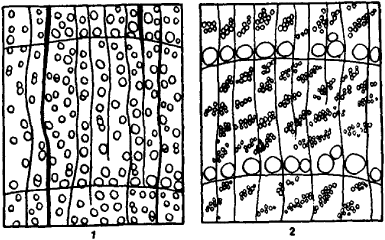 In diffuse-porous varieties, vessels of almost equal diameter are found throughout the growth ring, and their number in the early and late zones are approximately the same (as in birch and maple), whereas ring-porous varieties have considerably larger vessels in the early growth zone than in the late (as in oak, elm, and osage orange). Vessels may be found individually (in oaks) or arranged in clusters (in ashes, birches, and aspens); in the latter case, bordered pits are formed at the points of contact, and in the process of evolution the tracheids lose the function of water conduction and are replaced by libriform fibers. For example, ash wood is composed of vessels, xylem parenchyma and radial parenchyma, and libriform fibers. Woods also differ in the nature of the union between vessel elements, the type and distribution of perforation (simple, staircased), the shape of the elements, and the height and breadth of the medullary ray and the shape of its cells. Gymnosperms, including conifers, contain only tracheids (vessels are absent), a small amount of xylem parenchyma, and medullary rays. Some genera, such as cypress and juniper, have homogeneous medullary rays of identical parenchymal cells. In others, including pine, spruce, and larch, the rays are heterogeneous and contain ray tracheids which run along the main ray (see Figure 4). The structure of the ray, the shape of the cells, and the number and size of the pits are very important factors in determining the variety. In some genera (pine, spruce, Douglas fir, and larch), the wood has resin canals. Chemical composition. Absolutely dry wood of all varieties contains, on the average, 49.5 percent carbon, 6.3 percent hydrogen, 44.1 percent oxygen, and 0.1 percent nitrogen. The cell walls account for about 95 percent of the weight of the wood. The chief components of the cell wall are cellulose (43-56 percent) and lignin (19-30 percent); its other component substances include hemicelluloses, pectins, minerals (mainly calcium salts), a small amount of oils, essential oils, alkaloids, and glycosides. Lignification—that is, impregnation of the cell walls with lignin—is characteristic of all wood cells. There are more than 70 lignification reactions (for example, phloroglucinol with concentrated hydrochloric acid, which imparts a raspberry coloration). The wood of some trees contains tannins (quebracho), dyes (logwood and sandal), balsams, resins, and camphor. Physical properties. The physical properties of wood are characterized by outward appearance (color, luster, and texture), density, moisture content, hygroscopicity, and heat capacity. As a material, wood is used both in its natural form (as timber and lumber) and after special physical and chemical treatment. An important decorative property and diagnostic sign is the color of the wood, which varies within broad boundaries (hue, from 578 to 585 nanometers; color purity, from 30 to 60 percent; and brightness, from 20 to 70 percent). 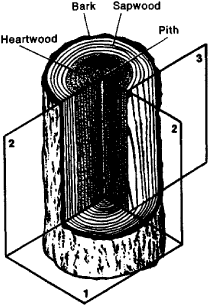 The luster of wood is best observed in certain deciduous varieties, particularly in a radial section. The texture and figure of wood formed by cutting across anatomical elements are especially striking in deciduous varieties. 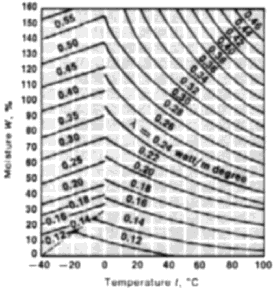 (see Figure 5). Lowering the bound moisture content shortens the linear dimensions and volume of the wood. This is called shrinkage. 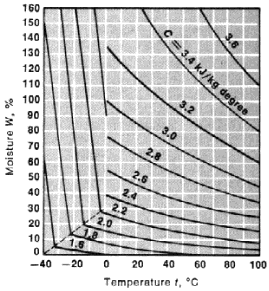 Wood shrinkage is determined by the formula where Sw is the shrinkage in percentage, ahl is the size (volume) of the sample at the hygroscopic limit, and aw is the size (volume) of the sample at moisture content W within the range 0-Whl. Absolute shrinkage (the removal of all bound water) in a tangential direction for all varieties is 6-10 percent; in a radial direction, 3-5 percent; along the grain, 0.1–0.3 percent; and in three dimensions, 12-15 percent. Increasing the bound moisture content and the absorption of other liquids causes swelling, the opposite of shrinkage. The difference in the values of radial and tangential shrinkage in seasoning (or soaking) causes transverse warping of lumber and unseasoned stock. Longitudinal warping is most noticeable in lumber with structural faults. Because moisture is removed unevenly in the drying process and because of anisotropy, internal tensions develop that lead to the splitting of lumber and round timber. Because certain stresses remain in the wood after mechanical treatment, it is kiln dried to change the dimensions and form of lumber pieces. Wood is permeable to fluids and gases; this is especially true of the sapwood and the longitudinal fibers of deciduous varieties. The density of the woody substance in all varieties is the same (since the chemical composition is the same)—roughly 1.5 times the density of water. Because of the presence of cavities, the density of wood itself is less and varies within broad limits, depending on the variety, the growth conditions, and the position of the sample in the trunk. 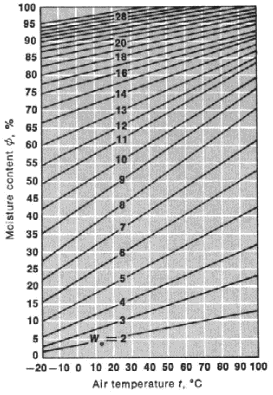 The density of wood at a given moisture content pw = mw/vw, where mw and vw are the weight and volume of the specimen at given moisture content W. With increases in moisture content, the density of the wood increases. Frequently an index that is independent of moisture content is used to calculate density: relative density ρr = m0/vmax, where m0 is the weight of the sample at W = 0 and vmax is the volume at W > Wh1. in Table 1 and Table 2. Thermal strain in wood is significantly less than the strains of shrinking or swelling and usually is not used in calculations. Certain electric and acoustic properties of wood are presented in Table 3. Low density conifer woods (such as spruce) are highly resonant and are widely used in the manufacture of musical instruments. Mechanical properties. The mechanical strength of wood is greatest when force is exerted along the grain; when it is exerted across the grain, the strength decreases sharply. Table 4 shows the average values for indexes of the properties of various woods at W = 12 percent. With increases in moisture to Whl, these figures decrease by 1.5-2 times. The modulus of elasticity of the fibers is 10-15 giganewtons per sq m (100,000-150,000 kilograms-force per sq cm) longitudinally; across the fibers, it is 20-25 times less. Poisson’s ratio for various types of wood and structural directions ranges from 0.02 to 0.8. The capacity of woods to bend under weight over a period of time, which characterizes their rheological properties, rises sharply with increases in moisture and temperature. Toughness decreases under prolonged stress. For example, the limit of long-term resistance in bending is 0.6-0.65 of the limit of strength during standard testing for static flexion. With frequent loadings, wood undergoes fatigue; on the average, the limit of endurance in bending is two-tenths of the static limit of strength. Wood is tested to determine the indexes of its physical, mechanical, and technological properties by using small flawless samples. A series of samples is tested, and the test results are evaluated using the methods of variation statistics. All measurements are taken at a moisture content of 12 percent. For most methods of testing, standards are worked out for the shape and size of the samples, the experimental procedures, and the means of calculating the property indexes. Wood is distinguished by sharp variability of its properties; therefore, the use of nondestructive methods for item-by-item testing of the strength of sawn lumber—based on such factors as the relation between the strength of wood and certain of its physical properties—is of particular importance when wood is being used as a structural material. The properties of wood are affected by defects such as knots, rot, fiber deviations, and pitch. In evaluating its properties as a structural and craft material, the wood’s ability to hold metal fasteners (nails and screws), its strength, and its flexibility (in certain deciduous varieties) are taken into account. The quality coefficient of wood (the ratio of the limit of strength to density) is high; it resists blows and vibrations well; it is readily worked and can be made into objects of complex shapes; it joins reliably to make handicrafts and structural elements that require gluing; and its decorative properties are great. However, along with the positive features, natural wood has a number of shortcomings. For example, its size and shape vary with fluctuations in moisture, and it decays when poorly preserved or maintained (for example, under conditions of high humidity, moderately high air temperature, contact with wet soil, and condensation of moisture). Decay is a process of decomposition, the result of the vital activities of fungi that infest the wood. To protect against decay, wood is saturated with antiseptics. Wood can also be damaged by insects. This damage can be prevented by using insecticides. Because of its relatively poor fire resistance, wood must often be treated with antipyretic agents. Economic significance. As a structural material, wood is used extensively in construction and cabinetry, railroad and communication lines (for the poles and sleepers of electric transmission lines), in mining (for timbering), in machine building and shipbuilding, and in the manufacture of furniture, musical instruments, and sports equipment. Wood is the raw material for the pulp and paper industries and for other types of chemical processing, such as hydrolysis and dry distillation. It also serves as a fuel. latsenko-Khmelevskii, A. A. Osnovy i melody anatomicheskikh issledovanii drevesiny. Moscow-Leningrad, 1954. Moskaleva, V. E. Stroenie drevesiny i ee izmenenie prifizicheskikh i mekhanicheskikh vozdeistviiakh. Moscow, 1957. Vikhrov, V. E. Diagnosticheskie priznaki drevesiny glavneishikh lesokhoziaistvennykh i lesopromyshlennykh porod SSSR. Moscow, 1959. Nikitin, N. I. Khimiia drevesiny i tselliulozy. Moscow-Leningrad, 1962. Drevesina: Pokazateli fiziko-mekhanicheskikh svoistv. Moscow, 1962. Ugolev, B. N. Ispytaniia drevesiny i drevesnykh materialov. Moscow, 1965. Leont’ev, N. L. Tekhnika ispytanii drevesiny. Moscow, 1970. Ugolev, B. N. Deformativnost’ drevesiny i napriazheniia pri sushke. Moscow, 197 . What does it mean when you dream about wood? Wood is a traditional source of heat and is one of the five elements used in clinical diagnosis in Chinese medicine. Wood also represents life and springtime. The hard fibrous substance that makes up the trunks and large branches of trees beneath the bark. A dense growth of trees, more extensive than a grove and smaller than a forest. Lumber or timber obtained from trees. The hard fibrous substance which composes the trunk and branches of a tree, lying between the pith and bark. a. a long-shafted club with a broad wooden or metal head, used for driving: numbered from 1 to 7 according to size, angle of face, etc. They may represent your unconscious or your “mental space.” If you are lost in the woods, it may be a reflection of feelings of confusion and a lack of clear direction.